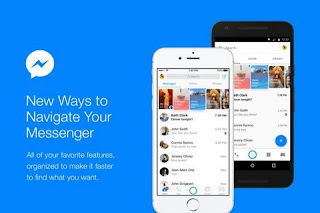 Facebook has announced that the company will work to make its Messenger smartphone app easier. Now the social networking site is now rediscovering its version. Now there will be three tabs instead of nine tabs. Facebook says that seven years after the launch of the Messenger app, Facebook is again heading towards its original design. Other than messaging, this work is happening Messenger Chief Stan Chudnovsky said on Tuesday, "We make another feature after a feature. All these are getting accumulated. ' They said that this is no longer just a normal messenger app, people can do other things including video calls, sending money and other things. It is notable that in a recent report, it was claimed that there is a feature of messaging the message in Messenger. That is, as soon as we can send messages to WhatsApp on WhatsApp, soon the message will be deleted in Messenger. According to the reports, Facebook is currently engaged in testing this feature, as soon as the testing is completed it will be developed in the app. Social networking website has now launched a special version of its messenger + app for kids to make Facebook easier for children under 12 years of age. In this app, the app will also have the option of parental control (i.e., the control of the child's Facebook Messenger in the hands of the guardian). With this help the parents will be able to monitor their children's activities and control them according to the needs. This app is now launched as a test for US iOS users. Initially it is being tested as a video chat and messaging app. Facebook's Product Manager Lauren Cheng said, "Facebook Messenger Kids has been brought so that children under the age of 12 can stay connected to their particular people. Also, their parents know about whom they are connected.